West Covina Truck Accident Personal Injury Attorneys Are You a Victim of ​a ​Truck Accident, Car Accident, Motorcycle Accident​ or Uninsured Motorist (UM) Accident in West Covina, California? Our West Covina Truck Accident Injury Lawyers and Wrongful Death Law Firm Can Help You! With over 40 years of experience in handling truck accident personal injury claims and wrongful death cases, our personal injury lawyers and Law Corporation can offer legal services for victims of serious accidents and families of deceased involving truck accidents with 18-wheelers or big rigs or any other motor vehicles in West Covina, California. Visit our home page and our lawyer profiles to know more about our West Covina & Los Angeles truck accident personal injury and wrongful death law firm. Moreover, it would be in your best interests if you actually contact us for a FREE personal case evaluation of your own particular truck accident or other personal injury claim, but you can also get some quick general truck accident advice on our Truck Accident Injury Advice Section. West Covina is a city located in Los Angeles County, California. A part of Greater Los Angeles, West Covina city lies 19 miles east of Downtown Los Angeles in the eastern San Gabriel Valley. According to the 2010 census, the population for West Covina was 106,098. Southern California consists of the second biggest metropolitan area, known as the Los Angeles Metropolitan region, in the U.S. The LA Metropolitan region comprises six (6) counties, namely Los Angeles, Orange, Riverside, San Bernardino, Imperial and Ventura. In fact, this metropolitan region includes the largest container port complex in the country along with a vital cargo center and major regional distribution centers with much truck transportation. For this reason, all the highways in this region, especially Interstate 5 and Interstate 710, are tremendously active with trucks and other motor vehicles, making it highly susceptible to 18-wheeler accidents. According to a Southern California DOT freight study, on a 27-mile stretch of the I-710 Freeway, 31 percent of the 2,250 accidents reported in the year 2000 actually involved trucks. With numerous commercial trucks plying on California’s many highways, the state is prone to fatal truck crashes and commercial tractor-trailer accidents. 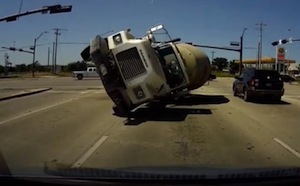 A major reason for such high rate of truck collisions is that some truck companies neglect the safety aspects and are solely or too concerned with their profits, which results in shoddy maintenance and repair work, reckless driving due to truck driver weariness or driving under drug influence, and other causes. Thus, the safety of other motorists, passengers and pedestrians is jeopardized. If you have been injured in any truck accident or any other accident in West Covina, Los Angeles, Riverside, San Bernardino or anywhere in California, or your loved one has been killed in a truck crash and has a wrongful death claim, then you should contact our experienced truck accident attorneys and law firm. Our compassionate personal injury lawyers will help you get your rightful compensation for hospital and other medical expenses, lost wages and lost profits, along with the emotional and physical trauma and pain you had to face. Please get in touch with our truck accident injury lawyers and our legal team now for a completely FREE CONSULTATION and case evaluation. You can also speak with an experienced truck accident injury lawyer or any member of our legal team at 818-222-3400 (after hours, please press 1) or by calling us on our Toll-Free number - 866 INJURY 2 or 866-465-8792 (after hours, again please press 1). You may also contact us by emailing us at info@WalchLaw.com! Our consultation is absolutely FREE and we work on a contingency basis, so there’s NO fee until you WIN!